One company watcher called the Nintendo Switch "disappointing", while gamers were left wondering how much it would cost and whether it was compatible with smartphones. In a three-minute video posted on its YouTube channel Thursday, Nintendo unveiled the hybrid machine which can be played at home and on the go, thanks to a removable screen with the controllers attached. The device is due to be released in March. "It's a disappointing console," said Amir Anvarzadeh, Singapore-based head of Japanese equity sales at BGC Partners. "It doesn't enhance the gaming experience when you have a smartphone in your pocket." The Kyoto-based company's share price dropped nearly eight percent at one stage on Friday before ending the day at 25,185 yen, down 6.54 percent. 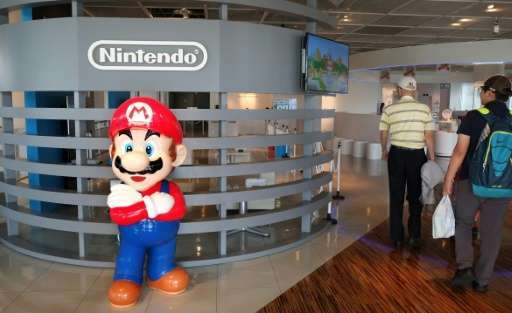 The console is seen as key to Nintendo's business, as it competes with Sony's hugely popular PlayStation 4. Nintendo, whose Switch uses cartridges rather than discs, is looking for a hit product to offset disappointing sales of its Wii U console. After years of pressure, Nintendo abandoned its consoles-only policy and entered into the smartphone game market earlier this year. In March, the company released "Miitomo"—a free-to-play and interactive game that allows users to create "Mii" avatars—as it tries to compete in an industry that has increasingly gone online. This summer it scored another hit with the Pokemon Go app, giving a boost to a Nintendo-created brand, although the game was developed by a US firm and the financial impact on the Japanese company's bottom line will be limited. Nomura Securities analyst Junko Yamamura was more charitable than some, calling the Nintendo Switch "formidable". But she added that it would not redefine gaming in the way that the original Wii console did after its launch a decade ago. "The concept for the product is in line with our expectation that it will be a hybrid of a stationary console and a handheld device," Yamamura said. "Nintendo has not come out with any surprises to redefine gaming... but we think the Nintendo Switch addresses some of the issues that came up with the Wii U and looks formidable." Respected game industry watcher Hirokazu Hamamura described the Switch as a "high-end" console that would run multi-platform titles designed for personal computers, PlayStation and Xbox. "Keen to know compatability with smartphones and price," he said on Twitter. Gamers expressed both delight and caution as competition heats up with Sony pushing its high-powered PS4 and PSVR virtual reality headset. "I am glaaaad Nintendo Switch came out better then expected!! (><) Mario Kart and Splatoon in pipeline, but how about Pokemon... Now I am growing less inclined to buy PS4..." one fan tweeted. But others were waiting on more details. "Nintendo Switch, I might want it depending on the game titles (^^)," said a fan.